Norbert and his son Stefan had one of the most remarkable results of the season, by clocking the fastest pigeon overall in a sun-drenched but very demanding race from Angoulême, with an astounding 17 minute lead in the yearling's race, and even 25 minutes ahead of the national winner in the old birds' race (two pigeons of Joël Verschoot). This is a rare achievement indeed. You can tell from past seasons that the team of Norbert Ally (69, a retired vet) has had a few spectacular results over the years. 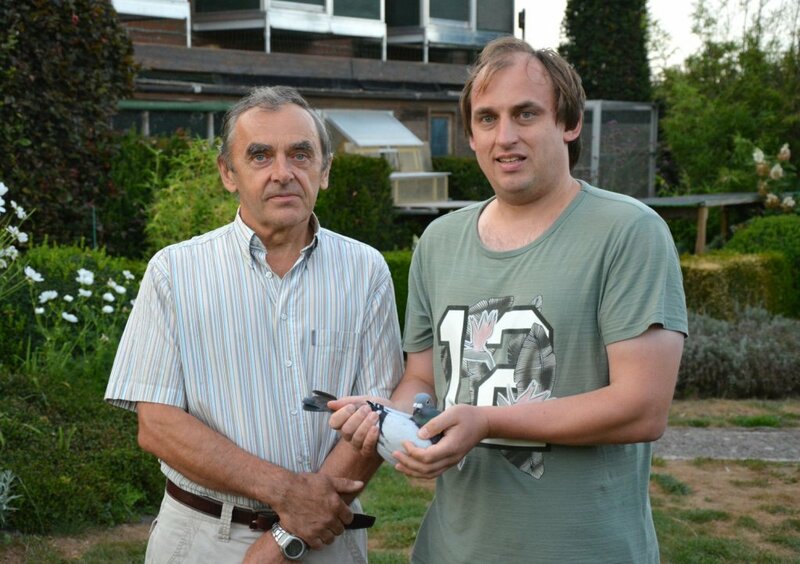 We still remember their fantastic result in Souillac in 2014, when they won a 1-2-4 national Souillac of 7,039 pigeons. It was the year in which they also became General Champion of Belgium KBDB. Next up was another national victory in 2015, with Neymar. He claimed a 1st Nat. 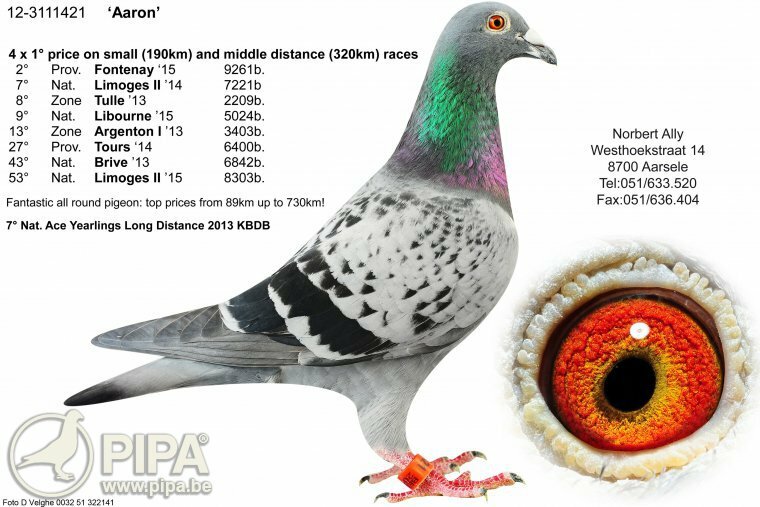 Montauban of 3,990 pigeons (as the fastest of over 6,000 pigeons), after having been close in 2014, when he won a 2nd Nat. Brive 3,850 YLs. Their recent top result from Angoulême marks their third national victory, and it was quite a special one. It was perhaps their most prestigious win in their already successful career. When you look back on the past racing season, to see what has happened over the course of the year, you will often come across the same names. This is especially true after a particularly demanding 2018 season, in which the most talented breeds will always come to the fore, especially in difficult races. 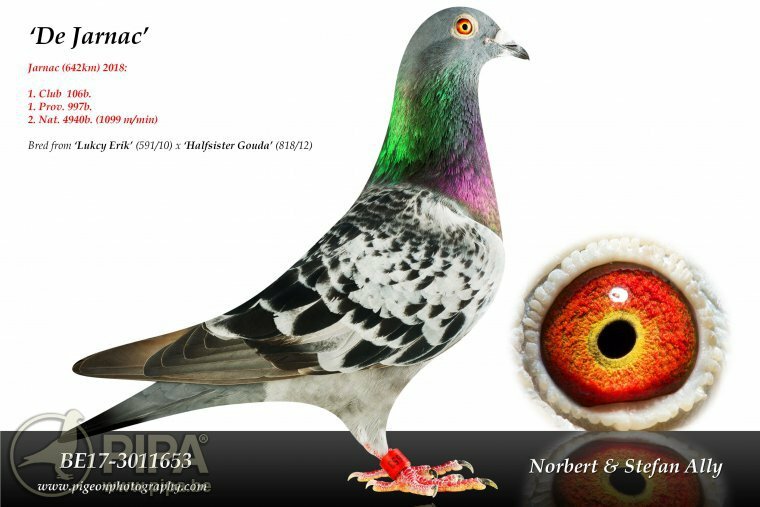 And that is where the pigeons of Norbert and Stefan Ally come in. This is a loft with many highly talented birds, which have won quite a number of top prizes over the course of 2018. Think for instance of their double provincial first prize from Blois on 2nd of June of 3,289 old birds and 3,367 yearlings. They were victorious again on 15th of July, claiming a provincial first prize from Jarnac of 997 yearlings (2nd Nat. 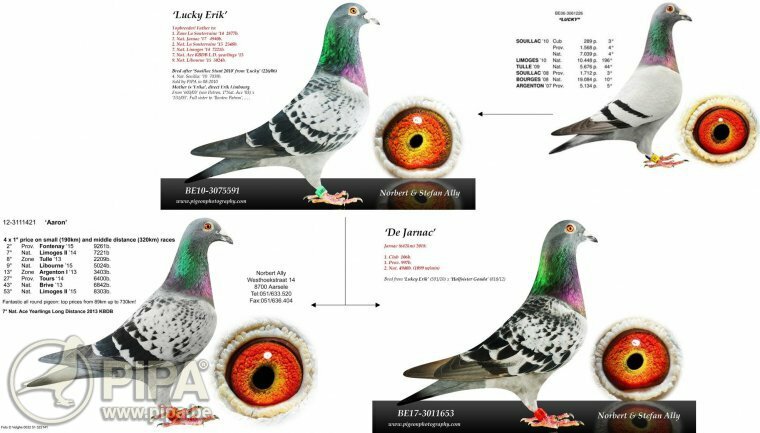 Jarnac), and they ended the season in style, in the closing national long distance race of 2018, claiming a national victory in a highly demanding race from Angoulême, with an impressive 17 minute lead over the entire field of 9,555 pigeons. The average speed was just under 1060 m/min, in sun-drenched conditions and a strong headwind, with temperatures reaching 30 degrees and more. This was a particularly hard day, with just 10 old birds and 8 yearlings reaching a speed of more than 1000 m/min at national level. The achievement of this national winner, which is now called Angoulême Vooruit, is nothing short of incredible. Breeding lines, some believe in it, others don't - it differs from fancier to fancier. 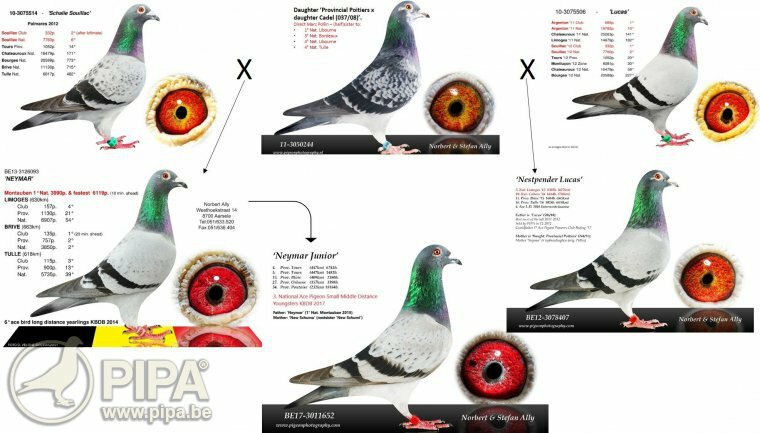 However, there is no denying that champions breed champions, and ace pigeons breed ace pigeons. It is an inherent part of their physiology. When this type of bird is capable of passing on its excellent features (orientation skills, willpower, vitality, etc.) to future generations, you end up with a high value breeding line, a line of champions that breed new champions. Most top class racing birds come from crossings, especially when the descendants of two top class breeding lines are paired to each other. It increases the chance of their youngster having the qualities of both lines. 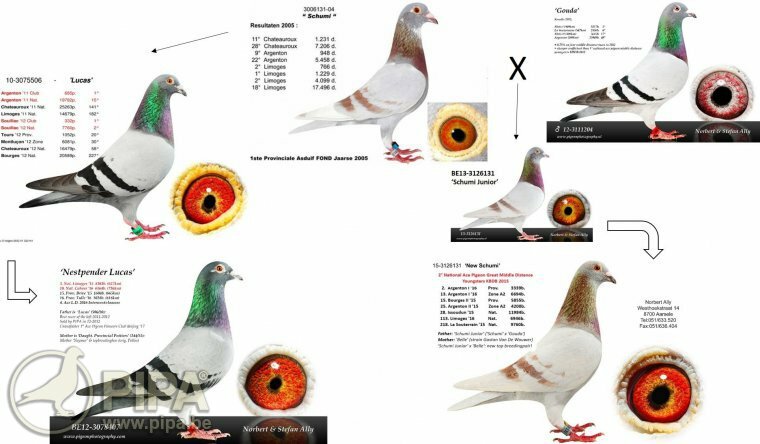 And being able to breed such racing birds season after season is what makes a pigeon loft successful for an extended period of time. 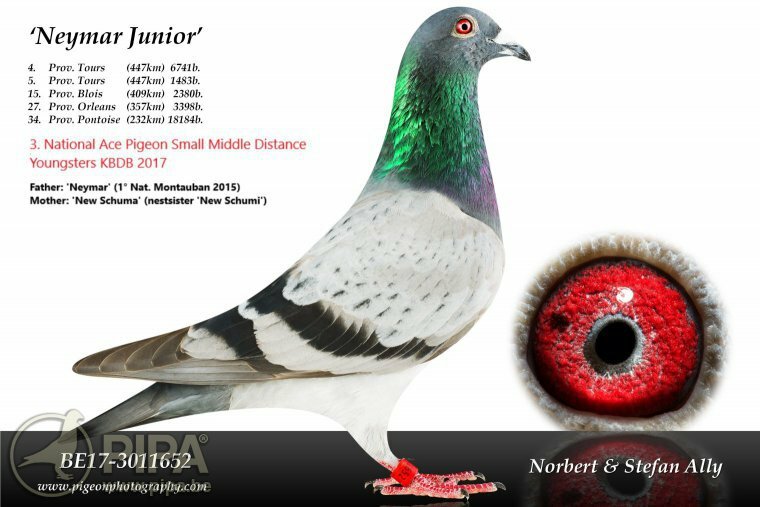 Take for instance Norbert and his son Stefan Ally; they have been top contenders at national level for several years now, with a team based around super class pigeons in the longer middle distance and the long distance. They became renowned thanks to the excellent bloodlines of such superstars as Schumi and Neymar. Up until about two years ago, the trio of Aaron BE12-3111421, 'De 341' BE12-3111341, and Neymar BE13-3126093 were the cornerstones of the Ally racing team. These fantastic long distance birds all developed into invaluable breeding birds for this team. And their bloodlines combine really well with that of Schumi (1st Prov. 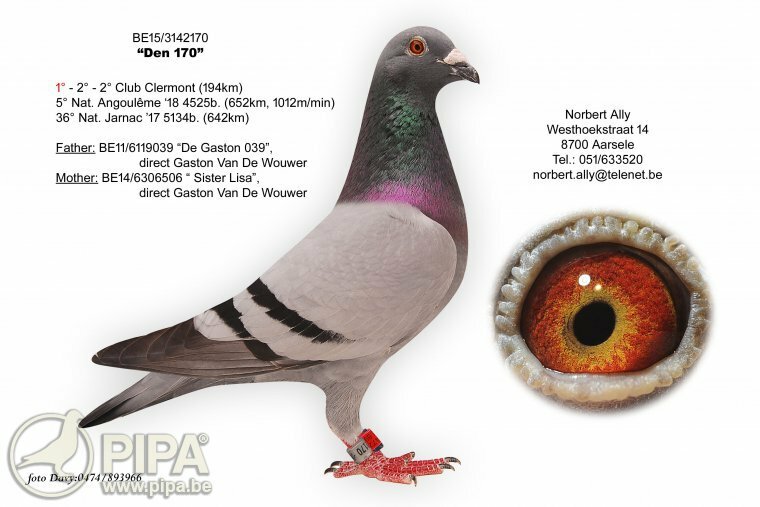 Ace Pigeon KBDB) and Gouda, which means Norbert & Stefan really have a good thing going. 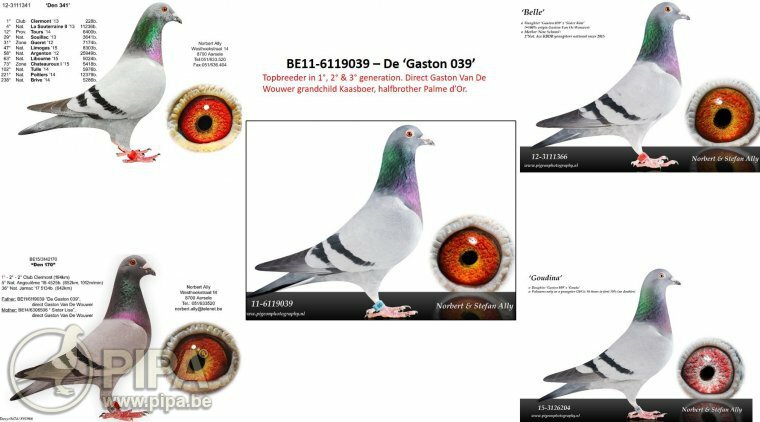 They crossed their existing breed (mainly based around the Gaby Vandenabeele birds) with pigeons of none other than Erik Limbourg and Gaston Van de Wouwer, and this led to another performance boost. Click here for a brief overview of 2018. This illustrates the breeding strategy that has led to great results over the years: breeding youngsters from your proven racing birds, while introducing other bloodlines every once in a while as well. One of the most headturning results of 2018 was the 1st National Angoulême by Norbert & Stefan Ally, which was a magnificent feat. They claimed victory in one of the most demanding races of 2018, in sun-drenched conditions and a strong headwind, with an astounding 17 minute lead over their closest opponents. They deserve a lot of credit for this victory. 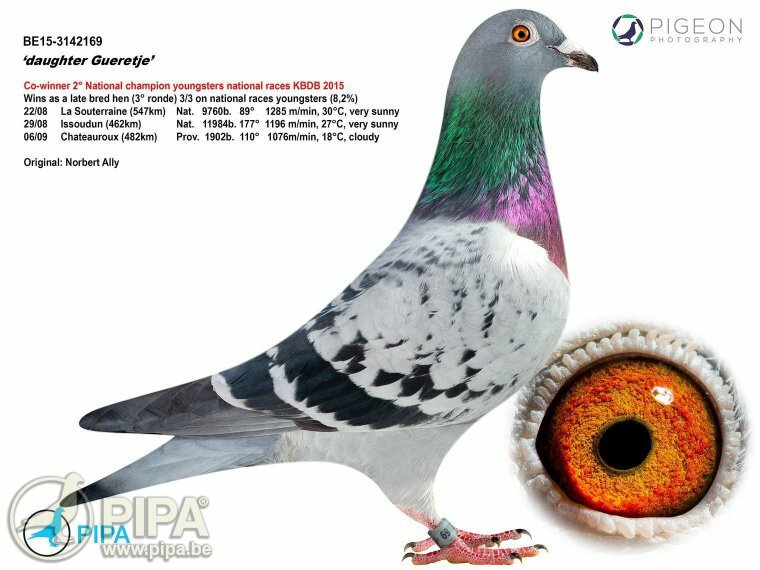 Their pigeon breed clearly knows how to win races with a big lead, preferrably in tough weather. They also won a 1st Nat. Montauban in 2015 with Neymar, also with a 10 minute lead. It must a joy, having such super class racing birds and their descendants in your breeding lofts. When all the pieces fall into place, you end up with another invaluable pigeon. The winner of this 1st Nat. Angoulême, Het Gueretje, is a perfect example. 3. Prov. Tours ’17 - 3478 p.
44. Prov. Chateauroux ’18 – 2,992 p.
77. Prov. Pontoise ’17 – 18,184 p.
90. Nat. Limoges ’18 – 7,236 p.
178. Nat. 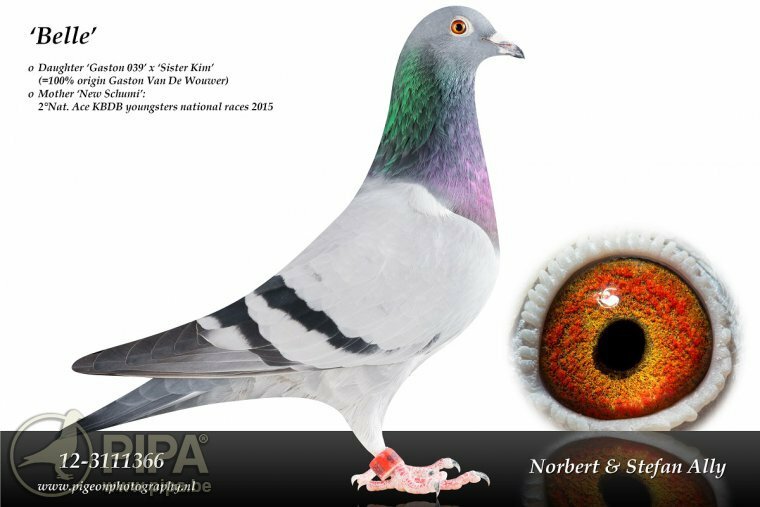 Argenton ’18 – 19,859 p.
The sire of this national winner is ‘Son Zidane’, which comes from Willem De Bruijn (NL). Click here for the pedigree. 2. Club Clermont 180 p.
3. Club Angouleme 110 p. & 36. Nat. 4,525 p.
6. 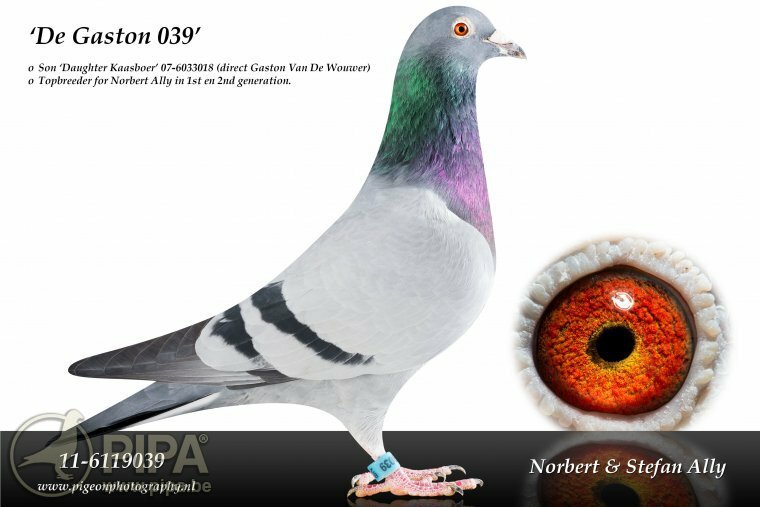 Club Clermont 151 p.
But Gueretje is most of all a full sister of supercrack New Schumi (a grandson of such iconic Ally birds as Schumi, Gouda and Gaston 039). 28. Nat Issoudun   11,981 p.
38. Nat Argenton   18,363 p.
65. 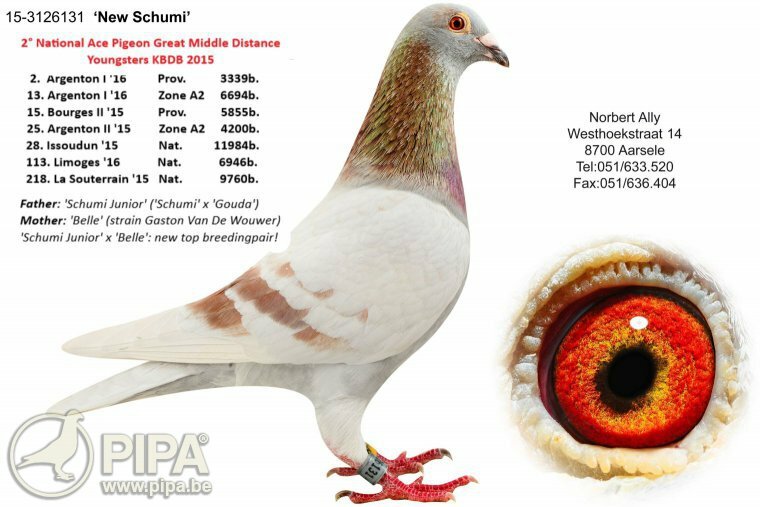 N.Zone Bourges 11,401 p.
Meanwhile New Schumi earned his stripes in the breeding loft, as the sire of such talented racing and breeding birds as Treasure (499/16), 600-hen (600/17), the ‘530/17’ (52nd Prov. Orleans 3,417 p.) and ‘531/07’. The last missing piece of the puzzle was that of super breeder Gaston 039, a direct Gaston Van de Wouwer (see pedigree), a grandson of the invaluable Kaasboer and a half brother of Palme d'Or, the dam of Amalia and Nikolaas: they both claimed a 1st Nat. 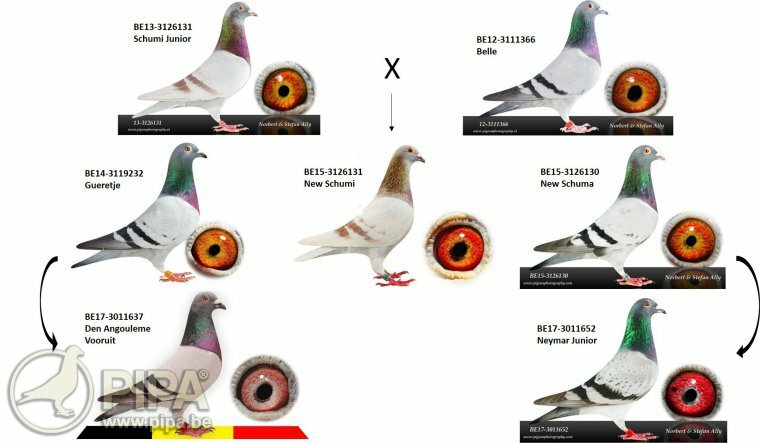 Ace Pigeon longer middle distance KBDB, in 2011 and 2013 respectively. This Gaston 039 is for instance the sire of ‘De 170’, supercrack ‘De 341’, Goudina, and Belle for team Ally. These are all excellent racing and breeding birds in this loft. 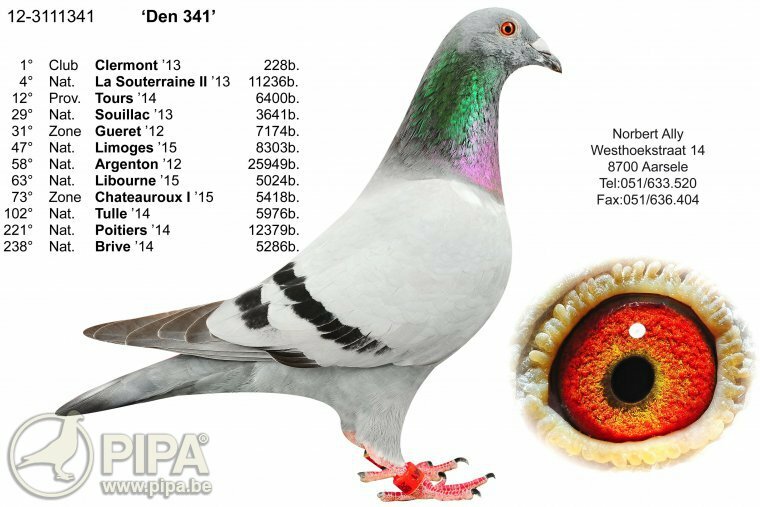 The 170 was in fact the second pigeon to arrive home from the demanding Angoulême for Norbert and Stefan Ally, claiming a 5th National old birds. 2. Club Clermont   229 p. ’17 - 11. WVOU 10.757 p.
36. Nat Jarnac    5,134 p. ’17 -  3. Club 109 p.
4. Nat La Souterraine 11.236 p. ’13 – 1. Club 335 p.
10. prov. Gueret        3.318 p. ’12 - 31. Nat. Zone 7,174 p.
58. Nat. Argenton      25.949 p.
73. N.Zone Chateauroux  5.418 p. ’15 - 30. prov. 3,078 p.
48. Nat. Angoulême    4,525 p. ’18 -  5. Club   110 p.
24. prov. Libourne      625 p. ’18 - 152 Nat. 3,176 p.
78. prov. Chateauroux 5,904 p. ’18 -  2. Club  ,595 p.
97. prov. Cahors      1,016 p. ’18 - 364 Nat. 6,356 p.
214. Nat. Limoges I   15,789 p. ’18 -  4. Club   289 p.
This is a fantastic bloodline indeed! 6. Prov Chateaudun 3,129 p. – 1. Club  78 p.
70. Prov Argenton   4,190 p. – 5. Club 445 p.
62. Prov Orleans     2,690 p. –  5. Club 264 p.
80. Prov Chateauroux 2,429 p. – 10. 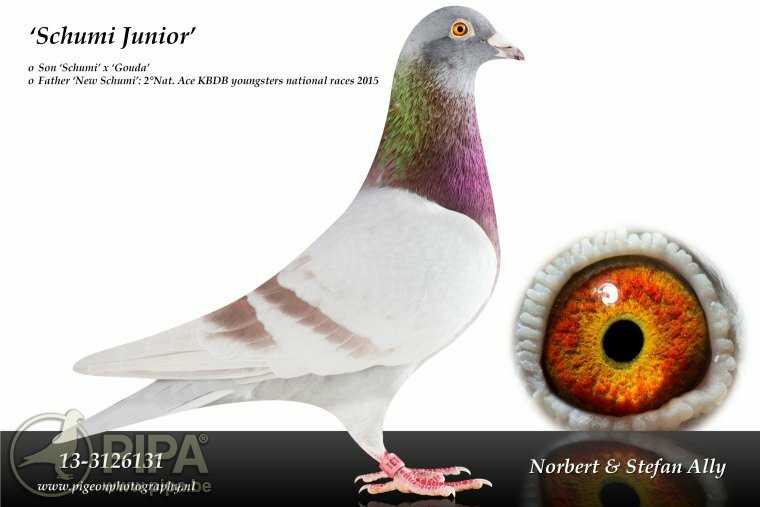 Club 215 p.
Besides Neymar Junior, Neymar is the sire of several other top birds, and these have won a 3rd Prov. Tours 5,313 p., a 43rd Nat. Jarnac 5,117 YLs, 57th Nat. Limoges 10,554 YLs, 4th Prov. Chateaudun 1,887 p., 48th Prov. Chateaudun 3,594 p. and 55th Nat. Tulle 5,326 p. in ’18, and much more. 14. Prov Blois       2,294 p. – 1. Club 77 p.
16. Prov Chateauroux 3,721 p. – 2. Club 372 p.
4. Club Fontenay      207 p.
5. Club Chateaudun     78 p. – 118 Prov 3,129 p.
6. Prov Chateaudun 3,129 p. – 1. Club 78 p.
62. Prov Orleans     2,690 p.
80. Prov Chateauroux 2,429 p.
27. Prov Chateauroux 3,721 p.
197 Prov Bourges     2,932 p.
44. Prov Chateaudun  4,748 p.
157 Prov Poitiers    1,688 p.
158 Prov Chateauroux 2,429 p.
167 Prov Argenton    4,190 p.
1. Club Issoudun      154 p.
34. Prov. Orleans    1,470 p.
117 Prov. Blois      1,470 p.
132 Zone Chateauroux 4,035 p.
343 Prov. Blois      3,498 p.
16. Prov Poitiers   1,688 p.
46. Prov Chateaudun 4,748 p.
1. Club Pontoise 298 p.
6. Club Pontoise 288 p.
11. Club Pontoise 733 p.
Neymar is indeed a fantastic stock breeder for this team; his bloodlines are an excellent foundation. For instance, the double winner of a 1st Prov. Blois olds and yearlings of 2nd of June 2018 originates from that same bloodline. He is a half brother of Neymar (from the same dam) paired to Schalie Souillac BE12-3078469 (a half brother Neymar, from the same dam). 32. Prov Chateauroux 2,992 p.
292 Nat. Limoges     7,236 p.
22. Nat Limoges      7,236 p. ’18 – 1. Club 77 p.
24. 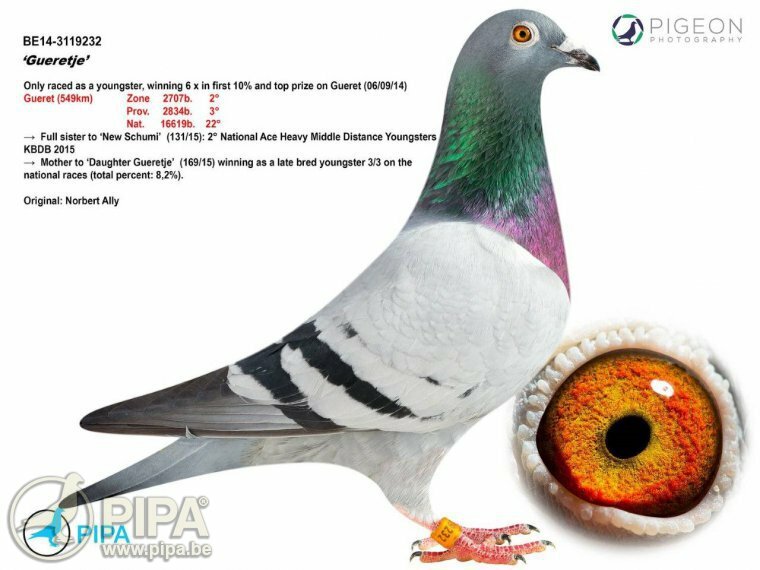 Prov Chateauroux 3,928 p. ’17 – 112 Nat 18,499 p.
The dam of Neymar (daughter Provincial Poitiers BE11-3050244 Pollin) is also the grandmother of an 8th National ace pigeon long distance yearlings (17-3075236) of Rudi De Saer! 5. Nat Angoulême    5,030 p.
26. Nat Jarnac       4,940 p.
4. Club Chateauroux   216 p.
306 Nat Argenton    19,859 p.
This Neymar bloodline is proving to be a high value bloodline. This breeding bird has a proven record already, and we think there is still a lot to come from this bloodline in the future. 8. Club Argenton  295 p. ’18 - 294. Nat. 19,859 p.
Click here for Jarnac's pedigree. 9. Prov Blois      3,367 p. ’18 – 3. Club 182 p. & 9. Prov. 3367 p.
43. Prov. Libourne ’18 -  184. Nat. 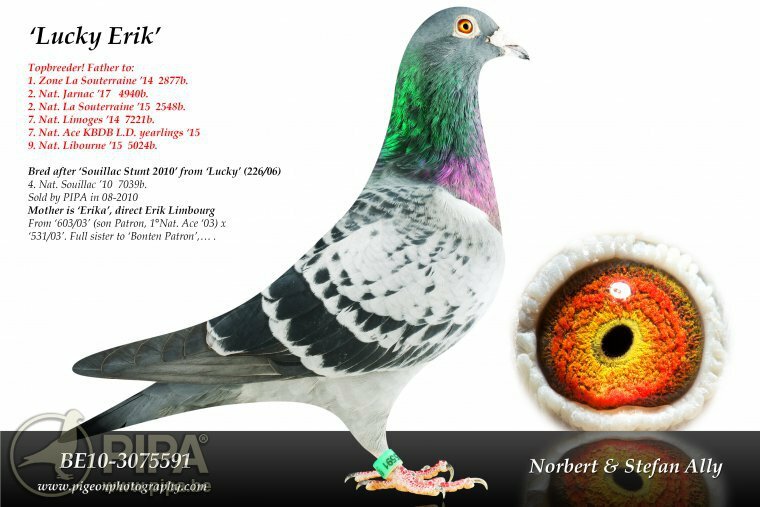 2.893 d.
Lucky Erik is also the sire of one of the team's best racing birds of 2012-2015, and this pigeon is now a highly valued breeder as well: Aaron. 1. Fontenay        599 p. ’15 -  2. prov 9,261 p.
1. Limoges         231 p. ’14 -  7. Nat. 7,221 p.
3. prov. Tulle     809 p. ’13 - 57. Nat. 6,972 p.
That is the least we can say when looking back at the numerous top quality racing and breeding birds in this loft. The team's in-house bloodlines of Neymar and Schumi, paired to outside breeds of Marc Pollin, Erik Limbourg and Gaston Van de Wouwer, have led to fantastic results. 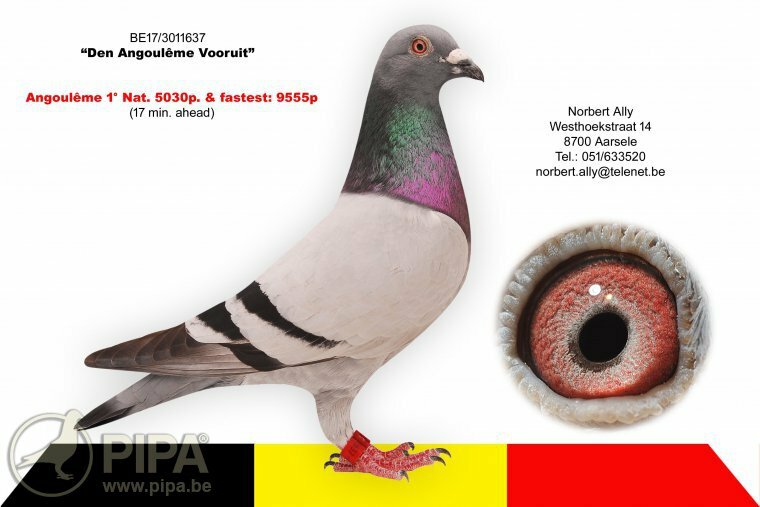 Norbert and Stefan Ally have a collection of pigeons that will likely continue to deliver for years to come. They can look toward the future with great confidence.